side note: Jim Johnson came in and blew the game for the A's yesterday and was then booed off the mound by the fans. Honest question...do you think Tommy Hunter can fill this role? I ask because I only caught the ninth on the radio after work, and the Sox announcers were wondering what the Os plan for closer was this offseason. I do. He's got alot to prove, obviously, but he has been really solid since his move to the bullpen (last year he had a 2.81 ERA over 68 appearances)and can hit the mid/upper 90's with his fastball when he wants to. I heard the same radio broadcast as Paul. they were talking a bit about his splits vs. righties and vs. lefties. I think lefties hit close to .300 against him last year. I don't know enough about him. I just heard that on the radio. I won't be shocked if Hunter struggles and a few guys get a shot at the role. Buck is extremely loyal to his guys (see: Jim Johnson and his league leading 9 blown saves in 2013) so Hunter will REALLY have to struggle, but other guys like Darren O'Day and Ryan Webb come to mind as potential replacements if need be... Hopefully it doesn't come to that though. If the O's can stay afloat in this first month with Machado still recovering and Troy Patton suspended for the first 25 games, I think they've got the talent to make some noise this year. Alot can happen over the course of a season though. Drew Hutchinson looked pretty good last night, hopefully we can get 31 more of those from him. Jays pitching has the talent to surprise with Hutch, Morrow and McGowan. Or they could all be hurt and it will be another nightmare season. You've obviously never been to Philly. Yeah, 2 weeks... shouldn't be too bad. I like the look of the "no-bat all-glove" up the middle with Goins and Diaz. at least she wasn't wearing a pink hat. Red Sox, LOL. First to worst starts today! Was at the game tonight. Felt really good to be back at the yard. I don't know why some photos rotate when they're posted. 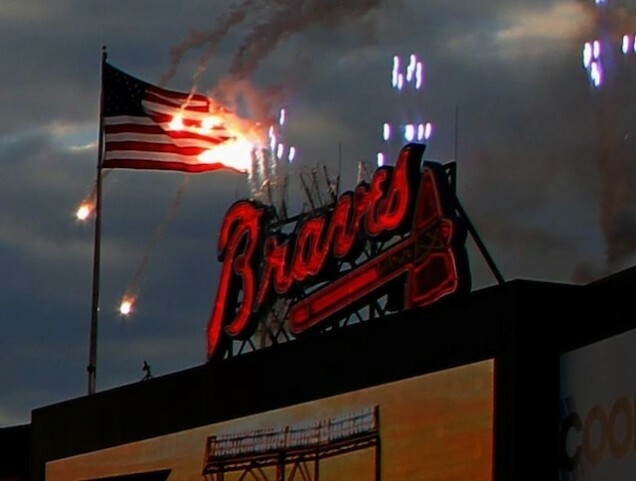 Are we talking about the Braves' home opener fireworks show yet? wow. first I'm hearing about it. What a disaster!